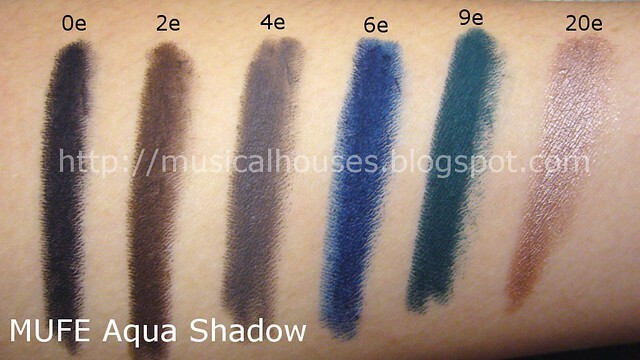 MUFE just launched their Aqua Shadow Pencils, which are basically eyeshadow pencils that are touted to be waterproof, smudge-proof, and basically long lasting. Awesome, right? There are 12 shades in this line, from surprisingly work-appropriate neutrals to the deep bold shades. The MUFE Aqua Shadow Eyeshadow Pencils launch was also extremely creative and entertaining, too. There were three models who were dressed up summer-style, with bright clothes, beach balls and everything, but the catch was that part of their clothes were actually body art! The guy's vests were painted on, as well as part of the girl's tops too. A variety of products was used to paint on the clothes, including the Aqua Shadow range. 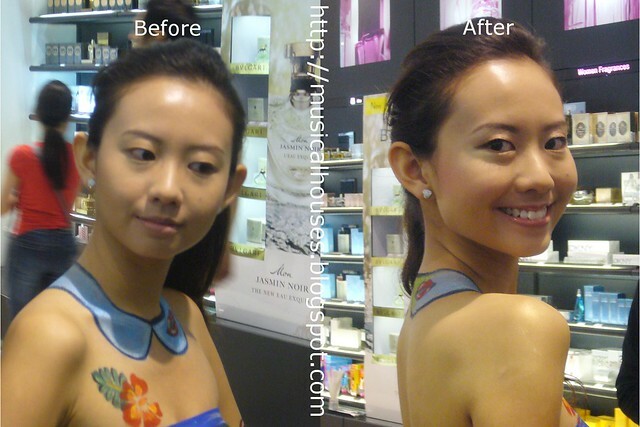 The idea was that the products used (that included the Aqua Shadow Eyeshadow Pencils, Aqua Liners and Aqua Creams) were indeed shown to be long-lasting and sweat-resistant on the models' bodies over the course of the day. We were also shown a demo of a look created by MUFE makeup artist! There are a few looks with different moods (exotic, romantic, glamorous, etc), but the look I saw was more of a romantic natural look. Here you can see the before and after. 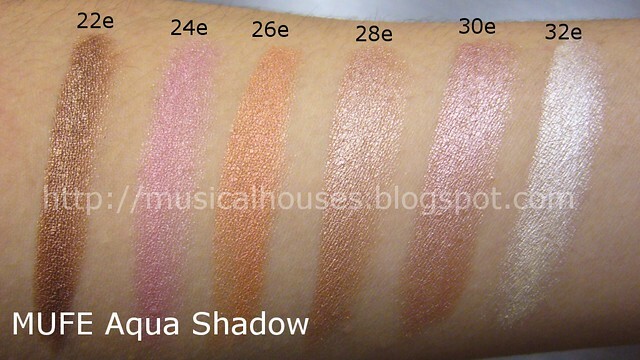 Finally, of course, here are the swatches. I realized that my photo doesn't give the colour names, so I've done that below. 0e Matte Black is just as the name says - a matte black. 2e Matte Brown is a matte neutral brown. 4e Matte Taupe Grey is a grey with a tinge of taupe. Very pretty and neutral. 6e Matte Navy Blue is a, well, matte navy blue. 9e Matte Green is a very pretty shade of matte emerald green. 20e Pearly Taupe is a shimmery pinky tan kind of shade - sort of a darker Stila Kitten or MAC Naked Lunch, if you will. 22e Pearly Copper is a shimmery browned copper. 24e Pearly Pink. This would be pretty on the lips too. 26e Pearly Peach. Nice orangey peach. 28e Pearly Beige. A medium shimmery beige, very useful for an all-over lid colour. 30e Pearly Pink Beige. A pinker version of 28e. 32e Pearly White. The name says it all. These are actually reall good in quality. The texture is very smooth and the pencils generally glide on well, although I think there is some variation between individual colours. The colours also don't shift, bleed or smudge. Once you apply them to your skin, they pretty much stay on the whole day until you take them off (you'll need an oil-based cleanser to remover all traces of the pencils). Given MUFE's previous success with their Aqua line products, this is bound to be good as well.